We’ve already described Follow Up Email Extension by Mirasvit on our blog, so now it is time to draw your attention to one of its closest competitors – Aheadworks Follow Up Email Extension. This smart tool monitors customer activity and automatically reacts to specified actions sending out follow-up messages. 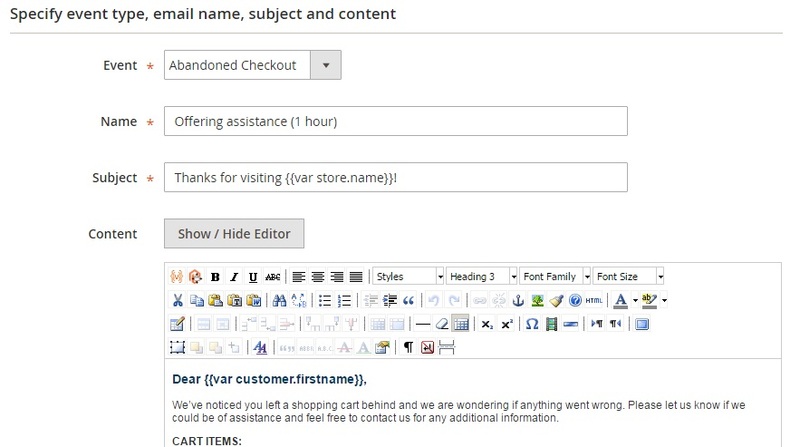 Magento 2 Follow Up Email extension by Aheadworks understands eight predefined events, provides Magento 2 abandoned cart reports, and offers built-in email templates designed uniquely for each follow-up case. Besides, there is a WYSIWYG editor for you and your admins as well, as the ability to create custom events. The extension seems promising, isn’t it? So let’s have a look at its core features and dive deep into the admin interface. First of all, we would like to draw your attention to the selection of events that trigger the conversation. Depending on which email should be sent to a customer, you can create a marketing campaign using a wide variety of events options. Available options are based on customer activities, including shopping cart abandonment (by guest users as well); changed order status; customer registration; any other customer activity; newsletter subscription; review submission; adding new items to a wishlist or sharing it; customer birthday. The most common one is abandoned cart. This trigger has the highest payoff since it helps to recover lost clients. Thus, the Aheadworks Follow Up Email Extension for Magento 2 and 1 directly contributes to your revenue. Order processing is another important trigger. With its help, Aheadworks Follow Up Email recognizes any change of order status sending a message to a customer. Due to this trigger, the module can also contribute to your revenue. Other triggers are based on customer activities including new registrations, long periods of inactivity, birthdays, and more. You can use all of them as triggers. All emails are sent depending on the specified conditions, like store view, customer groups, cart and products conditions, and others. As for internal extension management, it is clear and intuitive. Each email template is freely available in the backend assigned to a specific event. Emails can be organized and combined by a holiday, season, target recipients, location, or other criteria depending on your business needs. Also, you can set the main information, layout, header and footer templates of each particular email. Furthermore, there is no need to learn HTML, because Aheadworks Follow Up Email has a WYSIWYG editor that allows writing new email templates and editing existing ones. Moreover, you can add coupon codes to your emails to offer discounts to your customers. The Aheadworks Follow Up Email Extension for Magento 2 and 1 also has several more admin-oriented features. The backend is enhanced with business hints, so each trigger event provides short descriptions. All elements of the Magento 2 follow up email extension are available from a single backend location. Customer support and documentation are highly accessible right in the admin interface. Another great feature is scheduling, so your follow-up messages can be sent out within a predefined time intervals. Each event email can be scheduled to fire at the appropriate time. 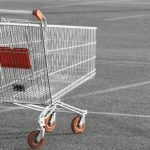 For instance, you can plan an Abandoned Cart email to be sent in 30 minutes after a customer abandoned the cart, or send a product review request in two weeks after order shipment. Setting specific conditions for each follow-up case is possible. The module also enables admin users to do split testing to compare different versions of the same email. Thus, with the A/B tests, you will be able to plan the best communication strategy to use for your ecommerce business. Besides, the extension provides merchants with convenient mail log for efficient email tracking and management. With the Follow Up Email module, you can utilize detailed statistics across all levels, including campaigns, events, and emails. It is possible to analyze effectiveness of each email within your campaign, as well as an entire email marketing campaign. One more significant feature of the extension is spam risks prevention thanks to the automated email chains functionality. As you can see, Aheadworks Follow Up Email Extension for Magento 2 and 1 offers the essential features via a very convenient interface. Let’s look at the module’s backend. In the Magento Admin, all campaigns are gathered under Marketing -> Campaigns. For each campaign, you can see the number of associated events and emails. Besides, the section allows editing, duplicating, or deleting each separately. As for the available stats, the Magento 2 follow-up email extension displays the number of sent, opened and clicked emails, as well as automatically calculates open and click rate. To edit the campaign, hit the appropriate button on the previous screen. Here you can change its name, description, and start/end date. Besides, you can turn the campaign on/off. As for event management, it is based on the same principle as campaign management: you can edit, duplicate, or delete each event. It is possible to add more emails as well. For each email, the Magento 2 abandoned cart report extension show the number of sent, opened and clicked messages, as well as calculates open and click rate. 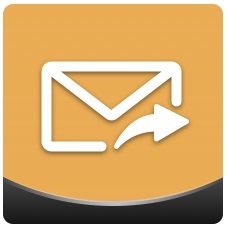 The Status column indicates whether sending email is enabled or disabled. In Actions, you can disable, duplicate, or delete each email. To edit an email, hit its name. 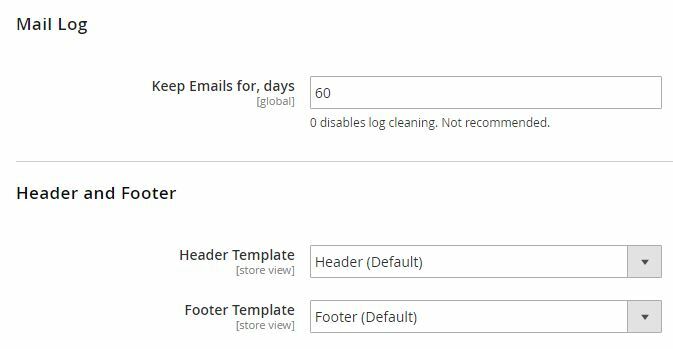 The Magento 2 follow up email extension will display a new window with general settings including email name and sending period, and A/B testing mode configurations and stats. As for the Mail Log section of the Magento 2 follow up email extension by Aheadworks, it contains a grid with all your emails. For each sent email, you can view its campaign, trigger event, name, A/B testing mode, recipient name and email address, subject, sending time and status. Besides, it is possible to preview, delete, or resend each email. The configuration section of the Magento 2 follow up email extension is available under Stores -> Configuration -> Aheadworks Extensions -> Follow Up Email 2. There are three sections there: General, Mail Log, and Header and Footer. The first one allows specifying sender contacts, test email recipient, BCC email addresses, and enabling/disabling the test mode. In Mail Log, you determine the number of days emails should be kept. In Header and Footer, select appropriate templates. As we have reviewed the earlier extension version before, you can see how great are the changes. Aheadworks not only creates modules with the necessary functionality but the company also permanently makes them better. Below, you can find the old review that describes the interface of the older version of the Magento 2 Follow Up Email extension by Aheadworks. All trigger events are listed on one page. 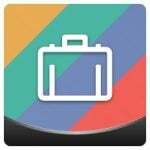 Each event has a small description, so you can easily find out the best use cases for each trigger. Besides, there is a little grid with all messages associated with the event. The grid is divided into four columns: Name (name of each email), Subject (a subject of each email), When (schedule for each email), and a column where you can disable each email. By clicking the email name, you proceed to the appropriate edit page which contains two tabs: Email Information and Conditions. On the Email Information tab of the Magento 2 follow up email extension, there are two sections. In the first one, specify event type (abandoned checkout, order status change, customer registration, last customer activity, customer birthday), email name, subject (you can use variables here), and content (WYSIWYG editor with variables). It is possible to preview or send test emails. 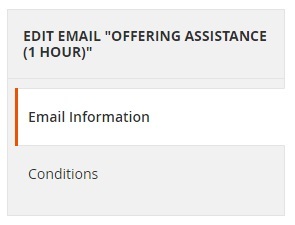 As for the second section of the Magento 2 follow up email module, specify a time interval (days, hours, minutes) after which the email should be sent. 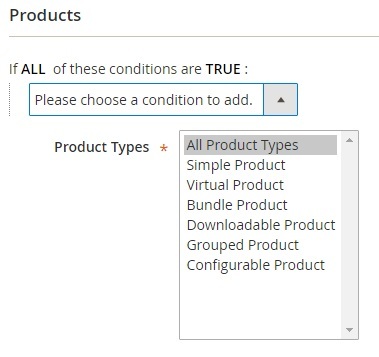 Now, let’s look at the Conditions tab of the Magento 2 abandoned cart report module, which is divided into four sections: General Conditions; Customer Conditions; Cart Conditions; and Products. 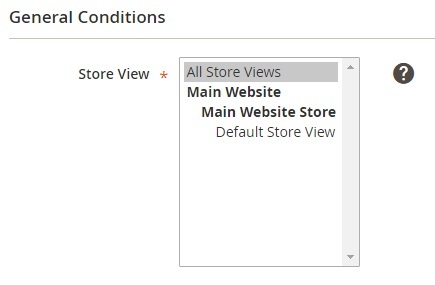 In General Conditions, the Magento 2 follow up email extension by Aheadworks allows specifying a store view. As for Customer Conditions, it is possible to choose essential customer groups here. 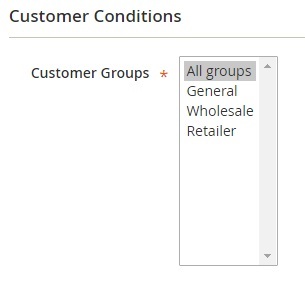 The section helps to implement segmentation, allowing you to try different approaches for various customer groups. Here, you can apply unique approaches to various carts: with a different number of items, subtotal, or other parameters. The Products section of the Magento 2 follow up email extension by Aheadworks is similar to the one as mentioned earlier, but it also lets you choose product types. The section is useful in the following situation: a customer buys running shoes, for instance, and you can offer a discount on goods from the same area by sending a follow-up email. The Mail Log screen of the Magento 2 follow up email module is designed for fast and efficient email management. There is an appropriate grid available here. The grid supports advanced filtering and sorting options as well as mass actions. Besides, you can customize the number of its columns. All available columns are the checkbox, ID, Created At, Scheduled At, Sent At, Email Name, Recipient Name, Recipient Email, and Action. Click on each row, and you will see how the email looks in a separate window. As for General Settings of the Magento 2 follow up email extension, they also seem user-friendly. You specify sender email address and test email recipient address here. Test Mode can be enabled/disabled. Besides, it is possible to choose for how long all emails will be available in the mail log. As you can see, Aheadworks Follow Up Email for Magento 2 is a reliable module that helps to improve your conversation with customers. The extension offers ready-made templates and triggers for those merchants who do not want to spend much time configuring the module. At the same time, the Magento 2 follow up email module supports lots of customizations, so that you can fine-tune the tool according to your business requirements. As for price, it differs a lot depending on the Magento version. Thus, the Magento 1 module costs $199 which is a standard price for such extensions. For this money, you get 90 days of support (180 days of support cost $60, 360 days – $80). Installation is not included, and it costs $55 more; the same is about priority support (additional $99). There is also an add-on feature called Advanced Segmentation. You can add it to the extension for $139. Thus, the total price of Follow Up Email for Magento 1 can be $552. It is much higher than other offers, but you get all advanced features and top-notch approach. The Magento 2 follow up email extension costs $499, and the module already includes 90 days of support, free installation, and personal account manager. As for segmentation, we have previously described it above. Unfortunately, you can not purchase a separate module for $200, but it is a very reliable product.